Not exactly a new factoid, but just to document the obvious I guess. Transportation/policy wonks know there is a lifetime of data in the National Transportation Database that is compiled by the Federal Transit Information. Usually this is the go-to source where you would find data on public transit ridership by mode itemized most of the public transit agencies in the United States. But there is also a lot of data on transit costs and what I just noticed, the average age of public transit fleets broken down by both agency and mode. So of course I had to go in search of some Pittsburgh exceptionalism, and it was not hard to find. But across the board, here are the oldest public transit modes in the database. I guess the result is not surprising given that at least Monongahela Incline is billed as the United States' oldest continuously operating funicular. Seriously though, it has the San Francisco Cable Car beat by almost four decades. The incline is so old that you have to wonder whether it's fair to keep counting its age in years. Sort of like Ship of Theseus, how much of the original incline is still there? Just before the end of the year the Census gnomes released the latest state population estimates for 2017. One news cycle that generated was the latest projections for what states will win and what states will lose congressional districts after the 2020 Census. In short Pennsylvania is pretty solidly in a range where it will lose one congressional district after the next reapportionment. That projection is part and parcel with the bigger story with what will happen with gerrymandering given litigation before the US supreme court and the state supreme court as well right now. What gets lost in the noise is what about what is going to happen in Harrisburg? The Pennsylvania General Assembly has 203 districts and the state senate is made up of 50 districts. Population change will impact the map of each of those districts just as they impact congressional districts. So what are we looking at with what we see so far? We only have 2016 estimates at the county level so far, but we can use the trends thus far this decade to come up with a decent guess for what areas within the state will wind up with greater representation, and which one will wind up with less. Here is the summary I am seeing if you just project out population changes April 2010-July 2016 through to April 2020 (the census reference month). The punchline looks like the changes resulting from the 2020 Census will be nowhere near as dramatic as what happened after the 2010 Census. No one count in the region other than Westmoreland is expected to lose much more than 1/10th of a general assembly district. For the Pittsburgh region, that is a big difference compared with what happened after the 2010 Census. You can see how big a change there as was locally in some old posts here. Basically Allegheny County saw a big drop in its representation in Harrisburg, losing closer to two whole general assembly districts, with a proportional loss among senate districts.Much different to be looking at losing maybe 1/10th of a district. In a sense the story mostly is a non-story for the county, and much of the region, but that is important unto itself. Of course, all of this is talking top line population changes, and the specific district maps that come out of the redistricting process could implement significant changes to the geography of all districts, but on average the result will not be as draconian for Allegheny County as it was in most previous scales. All of which is based on projecting trends through the decade thus far. If those trends have significant shifts in the next few years, the results will differ, but hard to believe they will shift much. The bigger punchline I see is that on the other side of the state the trends are leading to Philadelphia (as in Philadelphia proper, the city/county) could gain almost a whole general assembly district after 2020 Redistricting. If that holds up it would be the only gain in Philadelphia's representation in Harrisburg in seven decades. An interesting shift in Pennsylvania population dynamics for sure. So for my peeps on the other side of the state, that may be something to follow up on. An under-appreciated recent headline was that in September the Pittsburgh region’s unemployment rate to dropped to 4.8%. One headline noted that 4.8% represents a 9 year low here. For the region, looking at just the local unemployment rate is at best half the story if you want to think about what it means for future growth. The thing is, regions really compete with each other for investment and workforce. Just because the unemployment rate is high, or low here can’t really tell you much about whether workers are being pulled into the region, or pushed out. Things might be great, or horrible here, but economic conditions could be worse or better elsewhere. What you see is that Pittsburgh had a 7+ year long run (January 2007 – May 2015) when the regional unemployment rate dipped significantly below the national unemployment rate. It is no coincidence that corresponds very closely to the 7-year run when net population migration into the Pittsburgh region turned positive for the first time in a very long time (another topic there). Since August 2015, the regional unemployment rate has shifted, and has remained above the national rate. Unsurprisingly, most data show that net population migration again has more people leaving the region compared to the number arriving. So it is quite true that local labor force conditions are more favorable than in the past. I'd argue that compared to most past periods, the shadow overhang of underemployed or discouraged workers here is much lower now as well. That means the 4.8% we are measuring is probably a tighter labor market than some previous periods since the mid-1980s when the regional unemployment rate has been comaprably low. Other regions look back and compare the status of the workforce in the period before the 'Great Recession' of 2007/8 and its aftermath. For Pittsburgh, you long had to factor in the extended impact of job loss in the 1980s. The workers who lost their jobs in the 1980s and who remained here remained an impact on local labor supply and wages for an extended period of time. I'd argue their impact lasted decades, but at this point it really has to be the case that most of those workers would be retired and out of the active workforce. Still, at 4.8% in September, Pittsburgh's unemployment rate was a palpable 0.6 percentage points above the 4.2% for the nation that month. Makes it harder for local employers to pull workers here if they are facing solid labor markets elsewhere. Also, October data for the nation show another drop, so this gap will be harder to close. Just a curious time series if you have not seen it. Take a look at the time series for building permits for single unit homes across the Pittsburgh MSA. To be clear, this is for building permits issued only for single unit homes, not building permits overall. Still, something seemingly fell off the cliff for Pittsburgh at the end 2014, and has not come back. The lastest month here (August 2017) is showing 94 total single family homes being planned across the 2.35 million person Pittsburgh MSA. That works out to 4 per 100,000 in population. It is a remarkably low number not just compared to Pittsburgh's past, but compared to other regions. Without getting into a full benchmarking exercise, the 2.1 million person Cleveland MSA is showing 252 single unit building permits for the same month. That comes out to over 12 per 100,000 population. Both Pittsburgh and Cleveland are well below the national rate, which is still rebounding from the Great Recession. Nationally the 819K building permits in August work out to just over 250 per 100K population. That's all I have. If anyone has a clear explanation for the Pittsburgh drop right at the beginning of 2015, either in the local housing market, or if there is something else going on in the data, I'd love to hear about it. So last week new jobs data came out for the Pittsburgh region. As of September the region is showing 1.185 million nonfarm jobs in the metro area. That number is up by 17,200 year over year which is not a huge amount of job growth (~1.5%), but it is actually the largest year over year increase in local jobs in over 5 years (since April 2012). So that is something. But here is the bigger factoid. Manufacturing jobs in Pittsburgh have been trending down no matter what else you may hear. As of September the total number of manufacturing jobs in the Pittsburgh region was 82,600. Do the division and you get a surprising result that manufacturing jobs in Pittsburgh now account to just under 7% of all jobs. 6.97% to be overly precise. That has to be an all-time low. The thing is I doubt manufacturing jobs in Pittsburgh have ever constituted less that 7% of all jobs going back to the time when George Washington was president. Even at the beginning of the 19th century folks commented on the production industries here and manufacturing likely made up a palpable part of the workforce anywhere near the head of the Ohio River. In the early 1950's there was a point when 40% of all regional jobs were in manufacturing. 40%! To drop below 7% is not only pushing us even further below the national average for manufacturing jobs in the economy, but I am not sure the trend is about to change in the near term. Headlines show some palpable layoffs coming in what remains of the local glass industry are in the pipeline already, among others. For all the talk about a potential Amazon HQ2 coming to Pittsburgh, the news last week of massive layoffs at Westinghouse Nuclear is really a far larger story for Pittsburgh in at the near medium term and beyond. Granted, Amazon is advertising a potential new jobs count of ~50K, and the layoffs at Westinghouse are ‘only’ on the scale of 1,500, those two numbers to not really tell the tale. Consider that the Amazon 50K is entirely notional at this point. Even if Amazon's 2nd headquarters ever gets to that point, you have to expect it will not be anytime soon. Consider also that the nature of jobs at Westinghouse Nuclear are very different that what is likely to come with Amazon. No doubt Amazon is a technology company, but still the jobs at an Amazon headquarters probably won’t be on the same salary scale as the technical talent concentrated at Westinghouse. Consider then the long history and deep connections of the nuclear power industry in Western Pennsylvania. A mature industry has deeper supply chain linkages and deeper economic impacts than any new industry locating in any region. What jumps out is pretty startling. You do not see such concentration in broad occupational groups in any one area of the country. I once did this as a location quotient, but this ratio analysis works out much the same and shows just how big Pittsburgh was as a nuclear power industry cluster... a cluster with W at its core. At one point I am pretty sure there existed no bigger cluster of nuclear power engineers anywhere in the nation, at least when it comes to civilian workers. So losing a big chuck of that is going to sting, and sting for some time. A big deal for the region as a whole and really a big deal for Cranberry, and likely even Monroeville where many of those workers used to work before Westinghouse relocated. I won't even begin to get into the longer term impact of potential pension issues for Westinghouse that are emerging, issues that have to have a concentrated impact here more than anywhere else. Note that this is a big issue across Pennsylvania. Out in Harrisburg, Three Mile Island is essentially shut down because there has not been sufficient demand for the power it generates. The latest is that the plant will be shut down permanent, which will be a big hit on the economy near Harrisburg. Add it up and the collective losses of the nuclear power industry and pretty significant and may not be over yet. So two days in a row. It won’t be a pattern, but it's hard not to comment on the economic development news of the day/month/year, namely that Amazon dropped an RFP of sorts to build a 2nd Headquarters outside of Seattle, somewhere in North America. It has set off a frenzy among cities and regions thinking they will land what Amazon promises to be a huge new job creator. Something on the order of 50 thousand net new jobs which is a number that huge for even the biggest metro regions and hard to imagine here. Thus it is that Pittsburgh is seeking to join the fray. Why did Amazon do this? I really think they were encouraged by the very recent news of how the site selection for new Foxconn production facility went. In the end, Wisconsin was picked for the potential new site, a ‘win’ that came from what is reported to be up to $3 Billion in public incentives, a number and a deal that economists are only beginning to debate the efficacy of. Seeing that states are still very much engaged in (pick your industry of choice) chasing, Amazon saw they should be able to extract a deal at least as good as Foxconn received, potentially much bigger. Given they are reaching post-saturation in Seattle, growth has to be placed elsewhere and most likely they can get somebody else to pay for it. It all becomes a no brainer to throw out the bone and see what comes back. The full project size of what Amazon is teasing is far larger than Foxconn’s planned impact, think about that. So to be clear… everyone wants Amazon, but they have laid out some incredibly difficult criteria. I suppose that if you are Amazon, you can ask for (and expect) to get a pony because it’s hard to see how their full criteria could be met by any site in any region. You can read their full RFP yourself here, but here are just a few of the highlights. They want some normal things: access to an airport and major highways to begin. They need a lot of space, and I mean a lot. More on that later but right there the choices in Pittsburgh get very narrow. This is all akin to the not too distant site selection Westinghouse Nuclear went through when they wound up deciding to move to Cranberry vice some alternatives including Charlotte, NC. But this is Amazon and they also clearly spell out they want a downtown or downtown-like location. 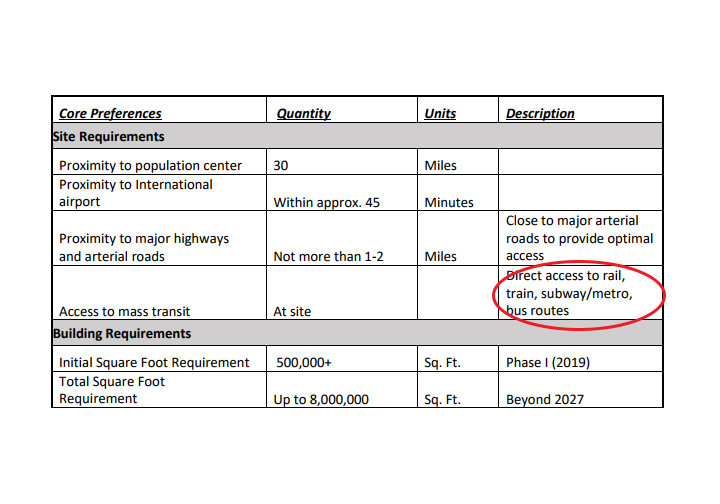 They want access to the major population center, someplace pedestrian friendly and access to “rail, train, subway/metro" and then lastly "bus routes". That makes this a very different type of site selection than is typical for projects this scale. I will note they have bus routes listed there last, but hold that thought as well. So if you take their criteria at face value, or honestly if you take each criteria at about half their asked for values you pretty much rule out anything in the greater Pittsburgh region, let only anything in the City of Pittsburgh. How much space do they want? One option is 100 acres of ready greenfield, and the potential to build 8 million square feet of office space How big is 100 acres of greenfield? The former civic arena site is advertised as 28 acres and is probably not even that, and is far from being a greenfield. 8 million square feet? The US Steel Building is ~2.5 million square feet of usable office space. So if you think you are going to get close to those criteria, it won’t be anywhere near Downtown or environs. Oakland? Stop there. You will have to look to those locations again out toward Cranberry, or the Airport, but then you have to go back to the criteria to be close to a surfeit of public transit. The long under development Almono site is obviously going to come up as an option. The site is big enough… 178 or so acres. Not exactly a greenfield, but much work has already gone into it. 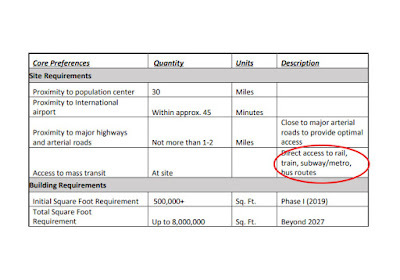 It is hard to see how the site meets the pedestrian friendly or public transit access criteria, but let's say they are not going to be too strict on either of those requirements. I think the big issue with the Almono site is that so much effort has gone into planning the site to include mixed uses and integration with the nearby neighborhood already, to go with a big corporate campus would almost require throwing all that away and starting over. Again, possible I suppose but hard to see at this point. But you think I’m being all Briem-naboby, which isn’t the case. If indeed Pittsburgh has any chance of getting the Amazon site it has to start with some reality check based on what they have very publicly stated they are looking for. Otherwise, any attempt to bring Amazon here is just for show. That, and I have the location. A great location along the river is a big plus. Public transit is a problem, but Amazon is clearly looking for better public transit than we have to offer. Their criteria lists rail, train, subway/metro before adding in ‘bus routes’. The Western Penitentiary site…. The state would have to promise to fund the expansion of the North Shore Connector a few more stops. Seems like a big thing, but given all they are asking for that may be one of the easiest things to pull off. So now you have transit right into Downtown. Walkability is a little weak, but you can point out the bike trail along the river that also goes right to the site and extends already out to Millvale. You could stretch it and call it the Lawrenceville to Amazon Bikeway, think what Larryville real estate prices will look like in a decade? Personally if this ever came to pass I'm buying up all the Millvale real estate I can afford. Also this fits into another narrative. If you really dig into the states decision to close the prison here, you will see that the data did not really support Pittsburgh being the one site to shut down. Marginally it should have been SCI Waymart. But in the end, the decision came down to close the site in Pittsburgh because it was beleived it had a greater, and unquantified, redevelopment potential. Well, here is that redevelopment potential on steroids. So there you go. Of course, the real killer in all this is just where I started. If Wisconsin was willing to put up ~$3 billion for Foxconn, you have to believe the incentives for this project will be much higher. Pennsylvania was long listed as a short list contender for the Foxconn project, but you really so no sign of that at the end and that is likely in part that Pennsylvania had no ability to play with those kind of $$$. So where would it get a bigger fund to pull this off. That I just do not know. Probably they need to pass a full budget in Harrisburg first. The great irony of this all is that the era of states putting up huge sums of money into ad-hoc tax competition chasing new investment was ushered in by Pennsylvania itself when it 'won' the competition to bring Volkswagen to New Stanton in 1976. So old is new again, but Pennsylvania no longer has the resources to compete in the game it created. Long time, eh? Well, something was eventually going to get me to post here again. This caught my attention and it is way too much to fit into 140 characters. The latest data from the Quarterly Census of Employment and Wages (QCEW) is out with data for the 4th quarter of 2016. So a long time ago it may seem, but for detailed industry level data you have to wait and live with the lag. Here is just one quick factoid that deserves further attention. Below is the employment trend for a very specialized industry: Scientific Research and Development Services (NAICS 5417). Notice anything? The latest quarter there has a big jump and has reached a new peak going back at least a couple decades, at least as far as we have been using NAICS industry classifications. The employment gain is +6.8% over the quarter, and +14% over the year; both solid gains in a region where overall employment change has been pretty flat. The recent trend in this specialized industry has been upward, and recent quarters have all been higher than in the past, but the gains appear to not only be continuing, but accelerating with the latest data. Lots to unpack in that, and most will have to wait for later. But a fundamental issue in Pittsburgh has long been that the competitive advantage local universities demonstrated in attracting research funding has not always found similar success in private sector commercial enterprises. Most employment in advanced technology and research, if it occurred at universities, usually showed up in education or health related industries. This recent jump in NAICS industry 5417 employment should reflect private sector employment outside of the institutions of higher education. Now I don't believe the private sector research sector in larger today in Pittsburgh than it was at all points in the past. When the Westinghouse R&D operation was at its peak, with Gulf Labs going strong and a range of other industrial research operations all together gave Pittsburgh a real concentration in research employment. Most of that employment would have shown up in the respective industries that each lab supported, so not necessarily in this specialized industry, or whatever its SIC-classified industry was similar. Still, many of those big research operations have all been gone for decades and Pittsburgh's technology-based economic restructuring is in a new phase. So yes, we have robots... or more accurately we design robots. The Wall Street Journal may have jumped the gun when its writers described Pittsburgh as Roboburgh back in 1999, at least when it came to jobs and output outside of the laboratory. But maybe we have crossed the Rubicon? Note the new data is all about municipal level population change, the county and regional population estimates for 2016 came out earlier in the year and had their micro news cycles already. All we just learned was about the pattern of estimated population change at the municipal level. As follows from the Allegheny County population estimates released earlier this year, the city of Pittsburgh's population is estimated to have continued a decline that goes back to 2013. What is also interesting is that the city's population decline (-239) is proportionally much smaller than the county's population drop between 2015-2016. There have been years (and decades) when the city made up a disproportionately larger (not smaller) part of the county's population change. Here's the deal, IMHO. These municipal level estimates really reflect the pattern of building permits issued in the the county. So pretty much this is all saying there have been more residential units planned in the city than the county average. Building permits lead to housing in the future, which presumably lead to new residents is the logic. Implicit assumption is that they are all occupied and the new units do not displace residents elsewhere. Important to note that the estimates assume a lag in the time from when permits are issued to when population growth happens. So for the mid-2016 population estimates just released, you need to look at past levels of building permits. So go back to one of my rarer and rarer recent posts from a year ago suggesting data on building permits is something to take note of: Um, building Permits in the city of Pittsburgh anyone? Take a look at the graphic showing recent building permits data. So you can tie up a lot of things with that one time series on building permits. Everyone who says the city is growing, a conversation I have a lot, always cite as their only evidence the many new big residential projects they see in concentrated in the East End of Pittsburgh. I always ask how that balances with new construction in Pittsburgh's West End, across the South Hills and Hilltop neighborhoods and across the northern reaches of the city. Most people extrapolate way way too far from construction concentrated in the East End. But there is indeed this spike of new units in the East End, and you can see just how unusual that has been for the city in that building permits graphic. That big spike does indeed get factored into the current population estimates we are now seeing for 2016. The result is the city showing far less population decline than the county overall. I also suspect that the natural population decline in the city is not as true in the city any longer because, as we have gone into here, the city's age demographic became much younger earlier this decade. Take that into account and it is probably true that the city's population is not even declining, but probably about net even. But, can it continue? If true that the city's population is stable, it took a big spike in building permits in one year to get that result. Can the city sustain that level of building permits every year into the future? That is another topic. So in a week and a half we will get the latest dump of municipal level population estimates for the nation. The primary interest here is likely to be the latest datapoint on population trends for the City of Pittsburgh. Why? There is an ongoing meme that the City of Pittsburgh is growing. But is it? So you can see why some might make a big deal of the first big sign that the City of Pittsburgh might be growing came with the release of population estimates for 2011. You can see the story from that time that pretty much has generated the persistent idea that the City of Pittsburgh is growing. PG: (July 2, 2012) Census data shows unusual rise in (City of) Pittsburgh population. Basically there was at the time a pretty noticeable net gain of 1,780 residents in the city between 2010 and 2011. That is a nontrivial gain for a city of 300K people, especially a city that has not grown in so long. But did it happen? Even at the time, you can read my quote in the article questioning what was going on in the data. In short, and I've gone into this in more detail in the past, the gain between 2010 and 2011 was an artifact two things. One was an error in some group quarters data here in Pittsburgh, specifically a dormitory that was assumed to have been missed in the 2010 census, but actually did close. The second issue was a change in methodology the census used just for that year in estimating subcounty (i.e. municipal) population estimates. The impact of that change I explained more here: Newgeography: Misrepresenting Misoverestimated Population. Still, the data said the city was growing, a factoid repeated to this day. But it turns out the Census gnomes themselves were not so sure. If you look at the revisions to 2011 data in subsequent data releases you see that the population gain mostly went away in data released the very next year. I’ve put this graph up here before, but here are the various releases of population estimates for the City of Pittsburgh. You will see that ongoing revisions have modified that early population jump. Note it didn’t go away, and that is pretty historic for the city no matter, but the population gain was only a fraction what was initially reported. Not +1,700 or so, but maybe +400. Small gains did continue into 2012 and 2013 but then population began dropping again. In fact, between 2013 and 2015, the city has pretty much dropped in population by more than was gained in the earlier years. Folk tend to overlook the latter observation. We will see what the latest data brings. Given that we already know the population estimates for Allegheny County in 2016 shows a significant decline from the year before, it is inevitable that the city of Pittsburgh will show a decline as well. The bigger question as to whether one thinks the population estimates are accurately depicting what is true on the ground is a bigger topic. I’ve gone into problems with building permits data – a key input for these population estimates – in the city of Pittsburgh in the past. But really the very common debate I get into of late is from folks who believe all the housing they have seen constructed in Pittsburgh’s East End of late is indicative of city population growth. I always have to remind everyone that Pittsburgh is a city of 90 neighborhoods and the vast bulk of them are still experiencing much of the same fundamental trends that has caused decline for decades. With just a few exceptions, aging and natural population decline is still ongoing if you move away from the areas of the city dominated by student populations. Now on top of that you also see lower income populations moving out of the city as they are drawn to lower cost housing outside of the city. If you really disbelieve that, cross a river or something and you may get the picture. Anyway.. that is all just preparatory for those who are planning on parsing the next round of data, with population estimates for 2016, which will come on May 25. Even if I had completely given up on blogging, this post I would have to write. An understated obituary notes the passing of my friend Will Steger in the Post-Gazette today. If you do not know Will, if you are an Pittsburgh East-Ender you probably recognize his consulting firm if only from its name. At the center of East Liberty (on Highland, just a few buildings away from the corner of Penn and Highland) you would see the CONSAD building. Basically Will founded CONSAD since he came to Pittsburgh in the 1960s and set up shop doing economic and policy consulting. If nothing else, he had a front row seat to a lot of East Liberty history, but that is just the beginning. As a lesson on what never to put off what you want to do, I long wanted to make time to do a more complete oral history project with Will on his life in urban economics and all things related. Alas, I let that slide and now regret it. But I have had the chance for many a long conversation with Will over the years (decades) and am grateful for that. Really if you dig into it, Will was really at the beginning of all that would later be called urban simulation and modeling. He was literally one of the earliest employees of the RAND Corporation and became one of the earliest folks to try and apply their skills in security world to urban problems. He told me he had been recruited here by Ben Chinitz, who was at the University of Pittsburgh then, to start work on urban simulation and modeling, and in particular to build a computer model of growth and change in the City of Pittsburgh. In the early years Will said he would share, or borrow, student programmers from the computing laboratory still in its early days at CMU. Really you will see his name routinely referenced in the academic literature on all the early work of folks trying to build computer models for cities and to apply the results to planning and policy. If you think that is normal stuff these days, 1) it still isn’t and 2) at the time was really an immense challenge. Basically he was years or decades ahead of the state of the field. There was so much more Just in passing he once said he was a tutor for Daniel Ellsberg when they were both graduate students at Harvard. Ellsberg being a game-theory economist of some note, but later much better known for his role in the leak of what became known as the Pentagon Papers. Will’s early work at RAND almost inevitably included defense and security work and he said he once was part of an interview with Curtis LeMay, famed commander of the Strategic Air Command early in the Cold War. I took the opportunity to scan where Will pops in the academic literature and some things I didn’t know. Are you a transportation or citizen participation wonk? Here is an article from the 1970s that was probably before its time: “Reflections on citizen involvement in urban transportation planning: Towards a positive approach” Transportation, Vol. 3, No. 2, July 1974. But one thing I’ve never been able to track down Will always thought that what later became the entire SimCity franchise of computer games (are they even really just games?) somehow grew out of his early work on urban simulation and computer models. I never was able to find any definitive provenance behind that, but I am sure it is true in some form. The genesis of SimCity includes references toother urban computer modeling efforts from late in the 1960s, but not the jump to Will’s earlier work. If anyone has any more specific info on how that early history may have translated to what became SimCity, I would love to hear it. CONSAD grew and he wound up working on a lot of other policy issues over the many many decades. He would tell me about work with President Johnson on the War on Poverty and with subsequent administrations to include a few more presidents. Later the firm wound up doing more energy work and other topics, but still the field of urban infomatics (a term only coined long after he was practicing it) owes a lot to Will. And the rest of us just appreciate the conversations. When I talk about Pittsburgh's economic history there are a few points that usually spark some pushback to this day. One is a basic observation that there are more jobs in the Pittsburgh region than there were before the collapse of steel-related jobs in the 1980s. Some folks, probably anyone who has any memory of that period of local history, finds that hard to believe. For them, there were just were too many jobs lost, and its hard to see where all the new jobs came to replace so many of the lost mill jobs. But it really is true. It is almost inevitable that the follow-on retort I get is that the jobs that 'replaced' the steel jobs were far less well-paying than the jobs that came before. One thing is very clear: for almost all of the workers who lost their mill jobs in the 1980s, very few ever regained the earnings power they lost. But for the region it is a more complex story. Yet it is certainly true that average earnings here are above where there were before the collapse of steel, even if adjusted for inflation. But that is true almost everywhere, the question is how have local earnings and wages compared to elsewhere. Cycling back to where I started. One other thing jumps out at this graph if you stare at it. While I push back on the idea that earnings are currently below where they were before the 1980s, wages in Pittsburgh were depressed for a long time. From an inflation-adjusted peak in 1978, average earnings in Pittsburgh only reached higher in 2004. So it took a full quarter century to get back to where we once were, long enough for a lot of memories to get set. And to be very sober about it, until just recently, average earnings have not really gained much above where we were in 1978, at least until very recently... and we will have to see if that holds up in 2016 data. Probably will be some pullback as those shale bonuses shrink. Thanks to various folks who have mentioned the blog here to me in recent months, suggesting it has been, at least marginally, value added in the past. There is no single reason it has been quiescent here of late, and I'm not quite sure people read blogs any longer, do they? But for a historical footnote, I really meant it when I said that much of the the Creative Class concept was 'gestated' in Pittsburgh. If anyone wants to read what may be the genesis of it all see this local report: Competing in the Age of Talent: Environment, Amenities and the New Economy, by Richard Florida, January 2000. You can almost feel that 'eureka' moment that set the path for all that followed. What I think many younger readers may not appreciate is the economic context when that was written. Most of the 1990s were part of an extended economic boom that had generated jobs and pushed down unemployment across the nation. In broad measure, economic conditions in Pittsburgh were doing ok, but was not keeping up with the regions that were really booming over that time. The nation had sustained so much growth that finding workers was a major problem for many firms. For anyone whose career experiences have been more shaped by the impact of the Great Recession and since, that all may seem like another planet. Still, it's hard not to read back on Richard Florida's earlier work without taking into account the economic history that spawned it. It turns out that one of the first posts here was about the recently opened Pittsburgh Mills Mall in Frazer Township. At the time local biz/politics guru journalist Jon Delano had a piece on how “Pittsburgh Mills future could be in doubt.” Last week the mall was again in the news with plenty of national coverage of the fact that much of the mall was foreclosed on and as a result was ‘sold’ for all of $100. All a formality of course as equity owners of the site transferred ownership to the lien holders who lent money to the project. Yes, the project is worth more than $100 most likely, but apparently less than whatever $$ is still owed on the loans. Thus the lenders submitted a de minimus bid to complete the transfer of ownership. Somebody lost a lot of money on the project to date. But a full accounting of the project is not limited to that. There was a lot of public money that went into facilitating the project as well. Little mentioned in much of the media coverage, but at the time it was developed, the county's $58 million dollar TIF (or Tax increment financing package) that went along with the project was the biggest TIF in Allegheny County’s history.I am pretty sure no public entity retained a stake in the project, and much of what was spent will not be coming back, but I note I know of know formal accounting quantifying that. The national coverage of the mall's 'sale' seems to imply that the developments are the result of greater travails in the nation’s retail industry. I wonder. The mall is one of the newer malls across the nation having only opened in 2005. A model of patience and tenacity if nothing else, the mall had been in planning for more than a quarter century before finally opening. Local developer Damian Zamias conceived the future Pittsburgh Mills project in the late 1970s. That’s right, the late 1970s. By 1997, local opposition to the project, lead by retail businesses near the new project, had been ongoing for 16 years. Some called the situation a veritable 'civil war' in Frazer Township and environs. Still the project proceeded. In 1989, Zamias and company threatened topull back from the project if Allegheny County did not continue support for a TIF to go along with the project. There seems to be have been no risk that would actually happen, and the prevailing wisdom was that the mall was ‘needed’ here. Zamias kept plugging away even though the drain of the project was a major reason his development company went bankrupt in 2001. You think that might have killed the project? Of course not. We all know now bankruptcy is merely a tool of the big developers and the very next year (2002) he raised new capital by bringing in some new partners. Why was the project ‘needed?’ Apparently back in the 1970s Pennsylvania, and many would say the same thing about Pittsburgh, was considered under-retailed, if you believe that. The metric seems to be based on the number of big regional malls per capita, or so I infer. And so, in 2005, after over a quarter century in the works, the mall finally opened to great fanfare. More than a few things had changed in the county from the time the mall was conceived and when it opened. There was this little tempest in the steel industry that impacted local jobs. The under-retailed Allegheny County over that period saw its population decline by ~370K people, and the opening of entirely new retail developments at projects including The Waterfront, South Side Works, Robinson Town Center (1998), Galleria in Mount Lebanon, the Mall at Robinson (2001), and expansions over that period at Ross Park Mall, the Waterworks, Settlers Ridge, and I am sure many more. As the project development continued on, more than a few other mall developments in Allegheny county failed. In 1979 Allegheny Center Mall was… well, an actual mall, as was Parkway Center Mall (sort of a mall? ), and there was the long forgotten Eastland Mall (now returned to fallow in North Versailles). So the market was taking down the major retail developments, Pittsburgh Mills proceeded unabated. The project proceeded pretty much under its own inertia because nobody was willing to question the underlying premise that public money was needed to push Pittsburgh Mills forward. Frazer is home to 1,300 people, many of them elderly. The land is rural, and the trees huddle together in bunches, like broccoli clumps. So you can't say the project in any way is part of the post-industrial transformation that Pittsburgh is proud of. Worth noting, the news is the mall was 'sold' to its lenders, but the mall is not closed. Far from it in fact and is still anchored by a few big retail outlets including Macy's. Macy's Pittsburgh Mills location does not even appear to be on the recently announced list of locations Macy's is closing. Just a few weeks ago the Pennsylvania Liquor Control Board announced a new location to open at the mall. Whomever winds up owning and operating the site in the future, the vastly lower debt burden that will have been written off will make for a more viable business going forward. There is a big point here that gets to economic growth across southwestern Pennsylvania and the region's future. Long a region suffering from the loss of manufacturing jobs, most any new development was seen as worth doing no matter. Questioning whether any project made sense was virtually impossible, and any possible opportunity cost left unaccounted for. Was the public effort put into building the Pittsburgh Mills Mall the best use of the money, let alone the public money, and effort involved? Was there any alternative that could have had a better chance to catalyze long term economic growth? I propose no answer to that here, but do speculate the question was never asked. The project was projected to produce over 6,100 jobs, by one public document I have seen. I don’t know the current job count out there these days, but it’s not 6,100 permanent jobs. Even the jobs that were 'created' there have to be just retail jobs that were likely displaced from somewhere else in the region. Retail is retail and not ever really considered value creation in the long run.